Obituary for Alice M. Paup | Hile-Best Funeral Home, Inc.
Alice M. Paup, 89, of Seneca, passed away Monday, September 3, 2018 at the Caring Place in Franklin. Alice was born in Van on September 10, 1928. She was the daughter of Harry F. and Lula Alden Whitling. 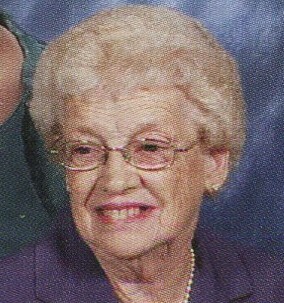 She was a member of the Seneca EC Church, and enjoyed quilting, embroidering, word searches, watching TV, especially game shows and cooking shows, reading, and playing Canasta. Mrs. Paup had been self-employed as a private duty home healthcare aide and caregiver. She was preceded in death by her husband, Mayo N. Paup, whom she married in Van of September 25, 1948. Mr. Paup died on January 21, 2007. Surviving is a daughter, Debbi Paup, of Seneca; a sister Ardelle Weaver, of Victory Heights; as well as a number of nieces and nephews. In addition to her parents and husband, she is preceded in death by two brothers, John and Gerald Whitling, and three sisters, Dorothy Gricks, Evelyn Heeter, and Mary Neal. Friends will be received at the Hile-Best Funeral Home Inc., 2781 Rte. 257, Seneca, Cranberry Twp., from 2-4 and 7-9 p.m. Tuesday. A funeral service will be held from the funeral home at 1 p.m. Wednesday with the Rev. Janor Bestwick, her church pastor, officiating. Interment will be in Brandon Cemetery, Cranberry Twp. For more information, or to send a condolence, please visit www.hilebest.com.